If you have a child with orthodontic problems (such as crooked teeth or a misaligned bite), you might be tempted to let them simply “grow out of it.” This is a choice many parents make in an attempt to “protect” their children from getting unnecessary orthodontic treatment. Unfortunately, this approach is somewhat misguided. 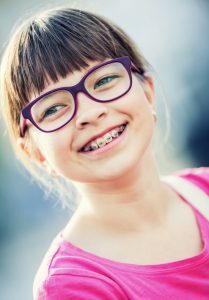 It is actually very important for your child to get an orthodontic evaluation at 8 years old, as this can prevent them from needing more extensive treatments later in life. It may be more beneficial to have two parts or phases of treatment. Simply having your child only complete one phase may not give them the same results and may leave them with unattended problems that can cause more issues in the future. You can think of the phases as two parts of a whole; they both manage and correct any problems your child might have, ensuring them the smoothest experience possible. Dr. Gary Cartwright, your orthodontist in the South Hills of Pittsburgh, is going to tell you a little more about each of these phases, and why both of them are important. Phase 1 refers to orthodontic treatment that is done before all of your child’s permanent teeth have erupted, most commonly between the ages of 8-10. Most orthodontic problems at this age are caused by growth-related issues, such as a narrow jaw, one jaw developing faster or slower than the other and lack of space or crowding. These issues are easier to treat while your child is still young. If you wait to treat your child when all the adult teeth are present you may lose the opportunity to correct problems with a simpler treatment plan or prevent them from developing in the future. More complicated treatment at a later date may require surgery to correct jaw issues or extraction of permanent teeth to address crowding. Phase 1 treatment serves to prepare your child’s mouth for their permanent teeth. You can almost think of it as clearing a path for them. Phase 2 usually starts when all of your child’s permanent teeth have erupted. The goal of phase 2 is to correct any problems that are best addressed when all the permanent teeth are present. Phase 2 treatment will position permanent teeth in a way that maximizes both their appearance and functionality. How Do I Know What Kind of Treatment My Child Needs? The only way to determine if your child would benefit from both phases of treatment is to visit Dr. Cartwright, your orthodontist in the South Hills of Pittsburgh. He will evaluate your child and develop a treatment plan that will best address their problems. He will determine if two phases of treatment would be beneficial or if the problems would be better addressed at one time in the future. The key for you as a parent, is that you shouldn’t simply wait for your child’s baby teeth to fall out before seeking orthodontic care. If you have any questions about either phase of orthodontic treatment, or want to schedule an appointment, please give us a call today.